Sixty three schools were represented at the Colorado State Track Championships last week. Berthoud placed 40th over all with all the points being scored by the girls team. The girls team finished the meet in 23rd place. The girls relay team placed 8th in the 4×100 meter with a time of 50:28 seconds and tied for 9th in the 800 sprint medley with a time of 1:52.60. In the girls shot put, Tanya Bezanson placed fifth with a distance of 37’ 1”, almost a foot further than the toss that gave her a second place finish in the Northern Conference Regional tournament. Joel Maly’s discus toss of 135′ 1” , was good for 13th place. 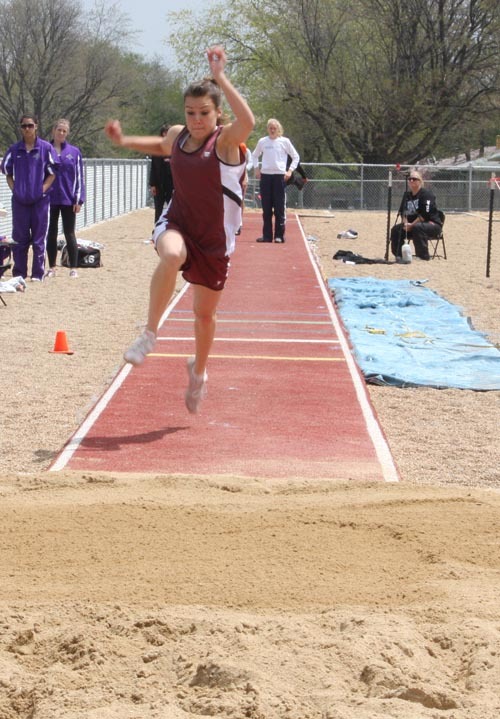 Cheyenne Hall jumps at the Northern Conference Regional meet on May 14.